Daegu, a city just one hour and 40 minutes from Seoul by KTX, is the living embodiment of Korea’s culture and traditional charm. The city has a multitude of nicknames, thanks to the many things to see and try, as well as the region’s specialties. During the summer season, Daegu is regularly hotter than other regions, earning the city the name “Daefrica,” a portmanteau of Daegu and Africa. The city is also the center of the nation’s textile industry, and home to relics of Korea’s modern history. Visitors to Daegu can enjoy a vacation satisfying to all five senses, through the local foods, cultural experiences, and beautiful surrounding scenery! Let’s set out on a two-day trip to discover the real Daegu. The first stop is Palgongsan Cable Car, an attraction loved by all. 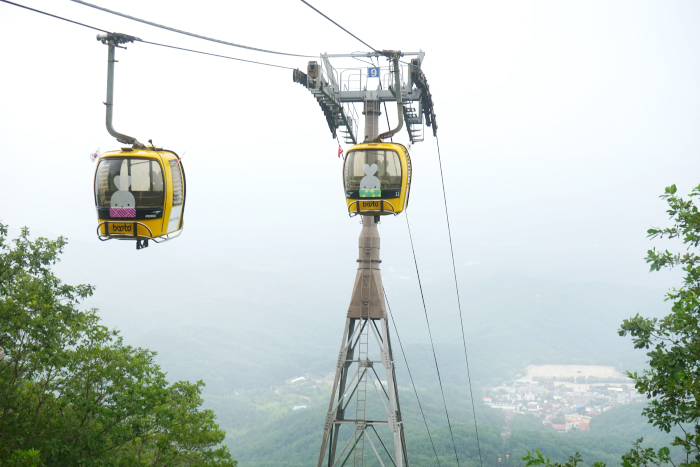 Located in the Donghwa Facilities Complex, the cable car runs round-trip to the mountain peak at 820m above sea level, offering views of the artistically beautiful nature. Take in the greenery of the mountain, while enjoying a thrill not unlike looking down from the top of a tall rollercoaster. When arriving at the peak of the mountain, you can see the entire city and surroundings spread out all around you. Photo zones to take great souvenir snapshots are place throughout the landing area, as well as trails heading in various directions for visitors who would like to take a short walk. Take fresh photos with the pure nature as a background, or enjoy a ‘forest bathing’ experience as you breathe in the clean air of the forest. Directions (Seoul Station → Palgongsan Cable Car, approx. 2 hours 35 minutes): Take the KTX from Seoul Station to Dongdaegu Station → Walk approx. 150m to Dongdaeugu Station Bus Stop → Take Rapid Bus 1 and get off at Donghwa Facilities Complex 2 Bus Stop → Walk approx. 325m to Palgongsan Cable Car. Directions (Seoul Express Bus Terminal → Palgongsan Cable Car, approx. 4 hours 35 minutes): Take an express bus from Seoul Express Bus Terminal to Hanjin Express Bus Terminal → Walk approx. 940m to Dongdaegu Station Bus Stop → Take Rapid Bus No. 1 to Donghwa Facilities Complex 2 Bus Stop → Walk approx. 325m to Palgongsan Cable Car. ※ Times listed are for August. Hours change by month so check the website before visiting. ※ Closed Mondays. If a public holiday falls on a Monday, operations will run as normal. 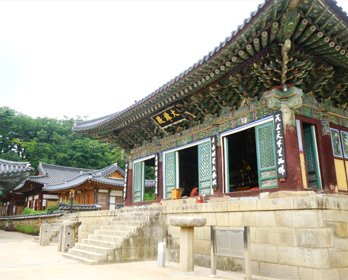 Donghwasa Temple, located near Palgonsan Cable Car, is a Buddhist temple with a history of over 1,500 years. The temple got its name during a period of reconstruction, when empress trees bloomed, signaling good luck. The temple grounds house many famous attractions, but the most famous is the Tongil-yaksayeoraedaebul Buddha! The statue is the largest stone Buddha statue in the world, with a height of nearly 33 meters. Standing in front of the statue, even the tallest person will feel small. Situated on both sides of the Buddha statue are two stone pagodas with heights of around 17 meters, making them the largest in Korea. After gazing upon Tongil-yaksayeoraedaebul, head to Daeungjeon Hall, the main hall of the temple. 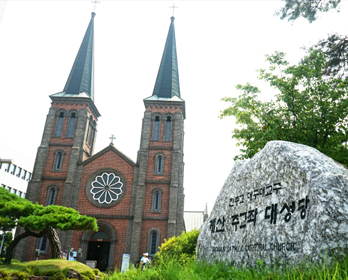 Located in the center of the temple grounds, Daeungjeon Hall is registered as Treasure No. 1536, and perfectly reflects the beauty of nature. The items that are sure to draw the eye most are the pillars and the front door panels. The pillars were created from twisted tree trunks, bringing a touch of living natural beauty to the interior. The door panels are carved and painted into the motif of various flowers, representing the Buddhist practice of presenting flowers before Buddha. TIP) In addition to the many things to see at Donghwasa Temple, the temple also offers experience programs. 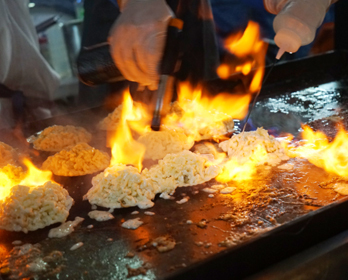 We recommend trying the temple food making experience (charged). The program, operating only with prior reservation, allows one to enjoy personally made temple food that is normally difficult to find. For more details about the program, or to make a reservation, send an email to aisiteru3@naver.com. Directions (Palgongsan Cable Car → Donghwasa Temple, approx. 25 minutes): Walk approx. 315m to Donghwa Facilities Complex 1 Bus Stop → Take Rapid Bus No. 1 to Donghwasa Temple Entrance Adjacent Bus Stop → Walk approx. 695m to Donghwasa Temple. 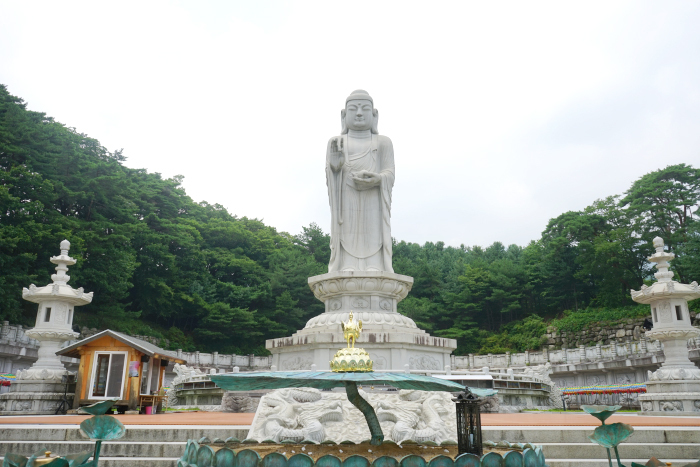 ※ It is possible to walk from Palgongsan Cable Car to Donghwasa Temple. Walking will take roughly 15-20 minutes. 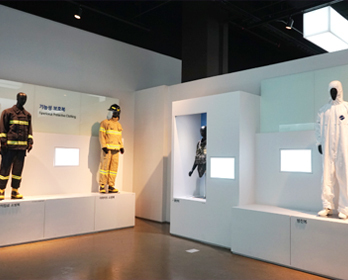 The center of textile industries, Daegu is home to a rather unique museum dedicated to textiles and their uses. 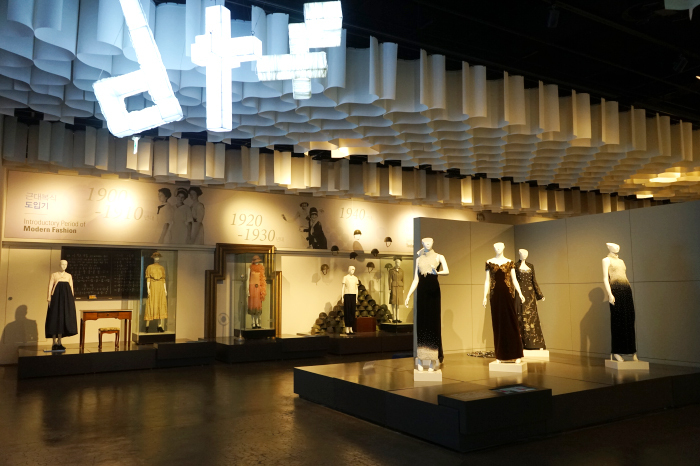 DTC Textile Museum is the only comprehensive textile museum in Korea, located in the Daegu Textile Complex. 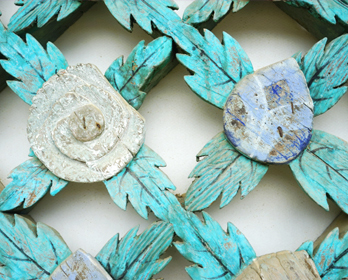 The museum has a total of three floors, divided into the past, present, and future of textile industries. The displays begin on the second floor, showcasing works from fashion designers, and the change in clothing and ornamentation over time. Moving on to the third floor, visitors can see the history of the textile industry and the machines used in the past to create them. The fourth floor aims to teach visitors about brand new materials made with cutting-edge technology and help to understand the process of creating these textiles. Each exhibition at the DTC Textile Museum is interesting to browse. Visitors will enjoy seeing the changes in fashion by decade, and experience the feeling of visiting an art gallery in the area displaying works by fashion designers. In particular, the artwork titled “Dancing Energy” is arresting. 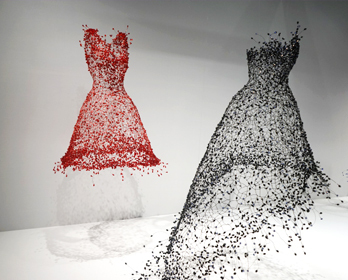 Created from small dots of fabric carefully pieced together, the work represents the feminine fantasty of beauty. Directions (Donghwasa Temple → DTC Textile Museum, approx. 50 minutes): Walk approx. 695m to Donghwasa Temple Entrance Adjacent Bus Stop → Take Rapid Bus No. 1 to Bongmu Park Adjacent Bus Stop → Walk approx. 445m to DTC Textile Museum. ※ Closed Mondays, January 1, day of Seollal (Lunar New Year’s Day) & Chuseok (Korean Thanksgiving). If a public holiday falls on Monday, will close the following day. In the past, Daegu was a fortress-city, called Daegueupseong. These days, it is hard to see any remainders of the fortress structure, but you can still find the layout in the names of the streets. Dongseongno Street, for example, gets its name from the path that was created along the eastern fortress wall. As the road formed, shops also opened along the street, and the area shows the clear transformation of Daegu. 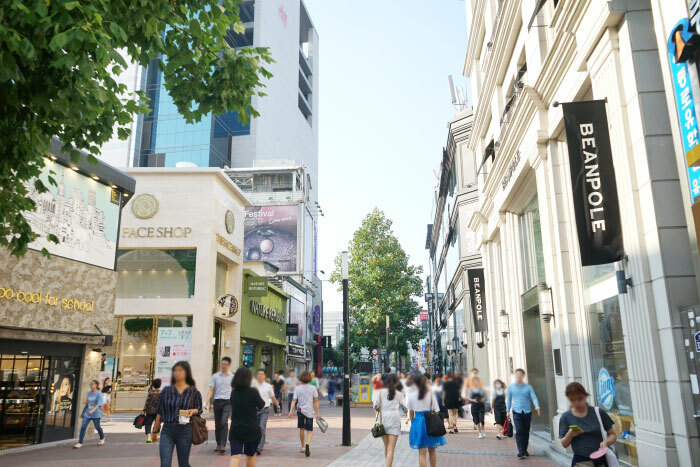 Dongseongno Street is the most popular shopping district in downtown Daegu, even being called “The Myeong-dong of Daegu.” The street is generally thronged with young people shopping or out on dates. Directions (DTC Textile Museum → Daegu Dongseongno Street, approx. 40 minutes): Walk approx. 125m to Daegu Textile Complex Bus Stop → Take Bus No. 401 to Daegu Station Bus Stop → Walk approx. 315m to Dongseongno Street. One of Daegu’s other trending hot places is Seomun Market! The largest traditional market in Daegu, the market specializes in textile merchandise. The market offers plenty to see, but really becomes active at night, when the night market starts. 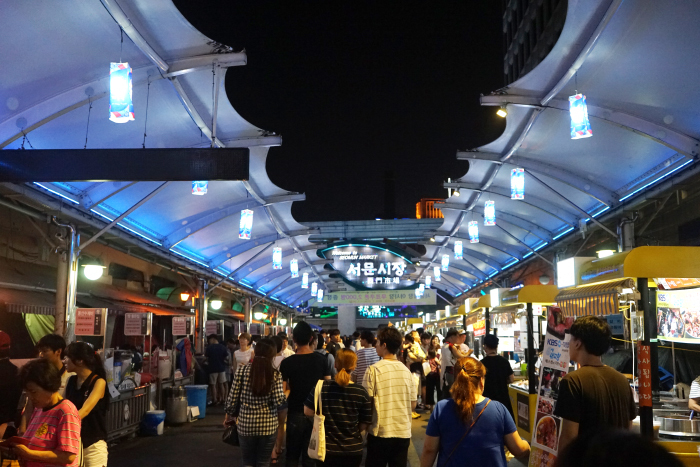 One of the three markets opened during the Joseon Dynasty, Seomun Market’s night market is larger than most. The streets are lined with about 80 different shops, most of which sell delicious foods. 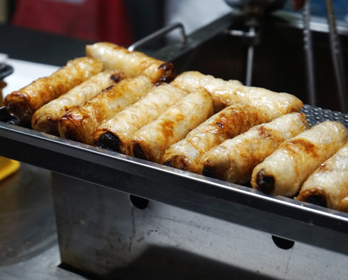 The vendors sell everything from Korean’s favorite street foods of mandu and tteok-bokki to Vietnamese cha gio and pho, for a completely global food experience. Pick the foods you would like to eat, and chow down as you wander through the market, enjoying Korea’s famous lively night atmosphere. Directions (Dongseongno → Seomun Market, approx. 15 minutes): Walk approx. 415m to CGV Daegu Hanil Adjacent Bus Stop → Take Bus No. 323 to Seomun Market Bus Stop → Walk approx. 245m to Seomun Market. There is a multitude of unusually named streets and alleys in the area of Jung-gu. Each street has its own unique hidden story and sights to see. 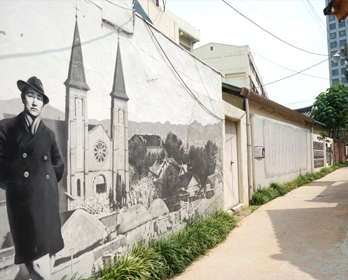 The collection of streets has been turned into a cultural attraction, “Tour down the road of modern history.” There are a total of five different courses to walk along and directly experience Daegu’s history. Each course offers plenty to see, but we recommend Course 2, Modern Culture Alley. This course covers roughly 100 years of local history. 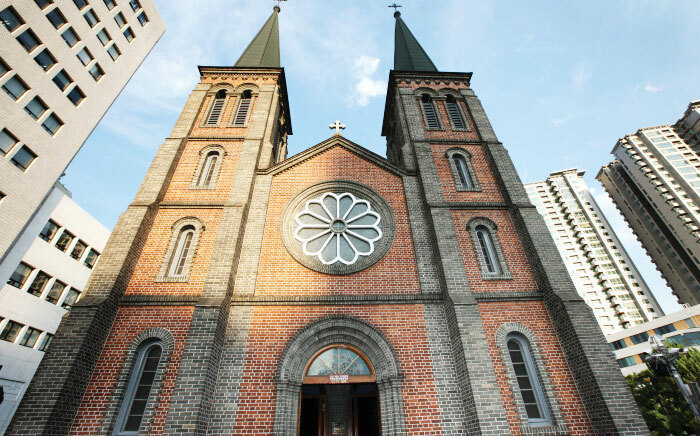 Major attractions include the house of American missionary Chamness, Daegu’s first Western-style building Gyesan Catholic Church, and Daegu Yangnyeongsi Museum of Oriental Medicine. Directions (Seomun Market → Daegu Modern History Streets (House of Missionary Chamness), approx. 10 minutes): Walk approx. 275m in the direction of Gidokyo Department Store → Continue approx. 305m in the direction of the House of Missionary Chamness. Set aside one hour to tour Daegu Yangnyeongsi Museum of Oriental Medicine while on Course 2 of the Daegu Modern History Streets. Experience the history and artifacts of oriental medicine through the museum, which is largely divided into a history exhibition and an experience center. 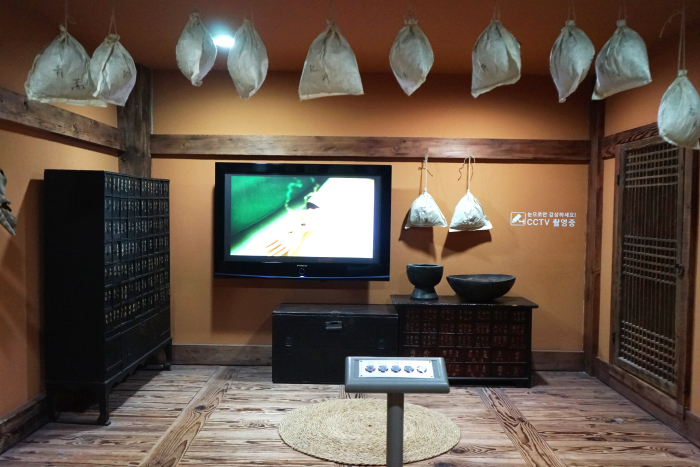 The history exhibition shows the origin and history of oriental medicine in Yangnyeongsi, while the experience center allows visitors to more easily understand oriental medical concepts like eumyang-ohaeng (positive and negative with five elements) and sasangchejil (four body types) through direct experiences. In addition to the indoor experiences and exhibitions, the plaza before the museum also has things to see and do. Take off your shoes and walk along the acupuncture trail, enjoying a walk while relieving stress and curing ailments through the many pressure points on the bottoms of your feet. After your walk, soothe your feet in the footbath pool, treated with medicinal herbs. The experience is free for all and easy to participate in, making this area a great place to relax for a while. 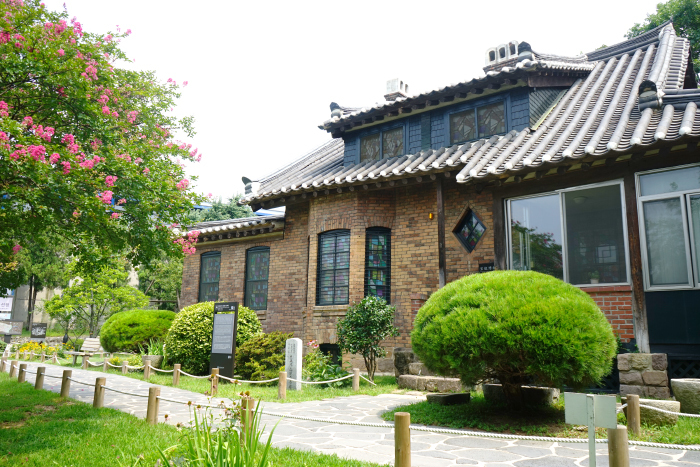 Directions (Daegu Modern History Streets (House of Missionary Chamness)→ Daegu Yangnyeongsi Museum of Oriental Medicine, approx. 11 minutes): Walk approx. 135m to Eldis Regent Hotel → Facing the hotel, turn left and continue approx. 105m to Daedongsa crosswalk → Walk approx. 300m in the direction of Geongang Yakeopsa → Walk approx. 85m to Daegu Yangnyeongsi Museum of Oriental Medicine. ※ Closed Mondays, January 1, day of Seollal (Lunar New Year’s Day) & Chuseok (Korean Thanksgiving). If a public holiday falls on a Monday, operations will run as normal. 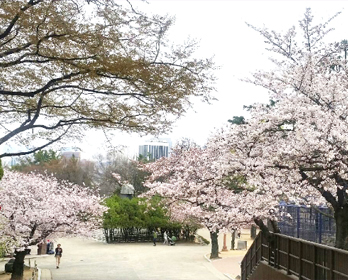 A filming site for the recent drama “Uncontrollably Fond (2016),” Daegu Dalseong Park is Daegu’s oldest park. With such a long history, the park has a multitude of attractions and things to see, serving as a popular picnic and family outing location for locals. As soon as you enter the park, your eyes will be drawn to the vast green field. You can also see a number of trails lined with benches stretching out across the park. 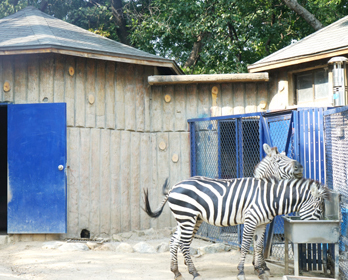 Daegu Dalseong Park is not only great for taking a walk, but it also has a zoo where visitors can enjoyably spend a few hours. The park and facilities are great to visit year-round, but we recommend visiting in spring. The cherry blossom trees throughout the park blooming all at the same time make a truly remarkable sight. Directions (Daegu Yangnyeongsi Museum of Oriental Medicine → Dalseong Park, approx. 20 minutes): Walk approx. 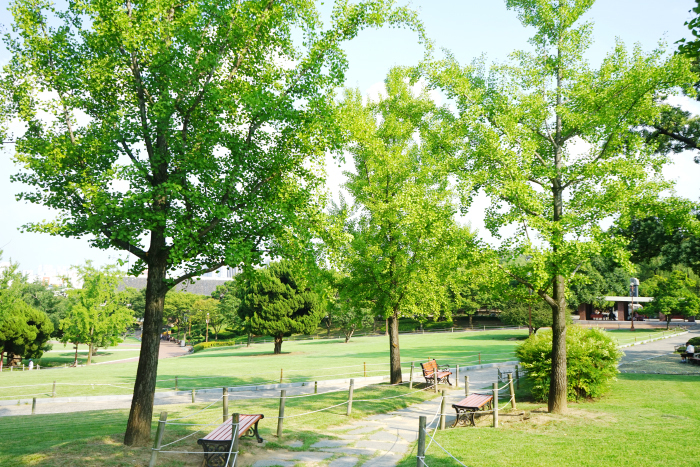 270m to Yangnyeongsi Entrance Bus Stop → Take Bus Bukgu 2 to Dalseong Park Adjacent Bus Stop → Walk approx. 310m to Dalseong Park. 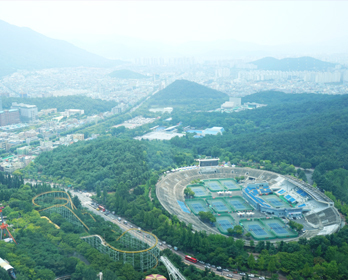 Like a birds-eye-view of Seoul can be taken in from N Seoul Tower, Daegu can be seen from E-World 83 Tower! 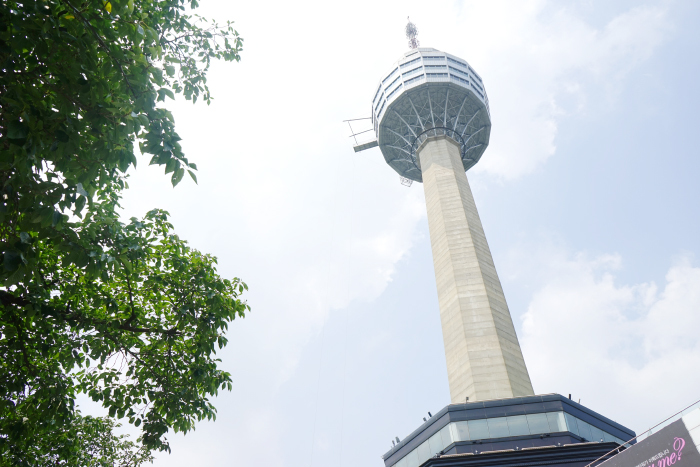 A landmark of Daegu, the tower gets its name from its height, reaching that of an 83-story building. E-World 83 Tower offers a fantastic view of the city, and the café and restaurant at the top are popular as a date course for their great ambiance. The most popular section of the tower is the observation deck on the 77th floor. The walls are made entirely of glass, offering a 360-degree panoramic view of Daegu. After taking in the view, head down to 4F to visit Sky Station. 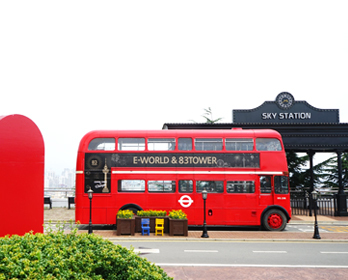 The station and the bright red double-decker bus parked out front serve as great backdrops for photos. 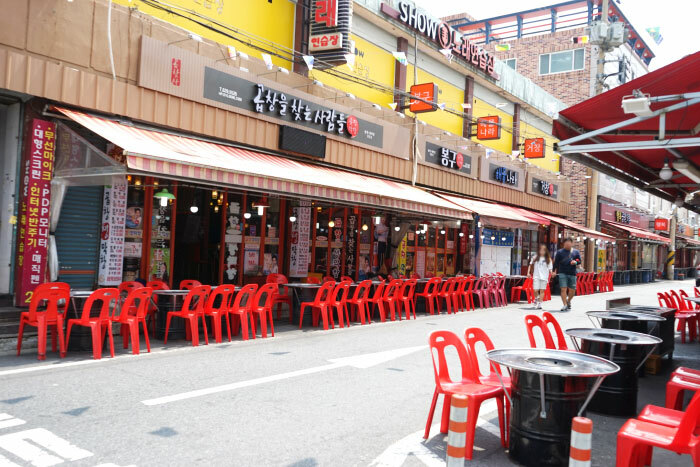 We can’t forget Daegu’s representative food street, Anjirang Gopchang Town. The streets here are lined with restaurants selling gopchang (beef tripe). The area recently underwent a facelift, with the shops getting new signs for a more unified appearance. The area has a fairly long history of selling gopchang. In 1979, a single gopchang restaurant opened in the area of Anjirang Market; soon after, gopchang restaurants began opening one and two at a time in the surrounding area, eventually forming what is now known as Anjirang Gopchang Town. The largest attraction of the restaurants here is the cheap prices on quality beef tripe! Enjoy the chewy texture of flavorful gopchang on your trip to Daegu. Suseong Resort is located at Suseongmot Lake, the only lake in Daegu. The lake was originally made to serve as a water reserve for agriculture but is now used as a rest area for locals and an attraction for tourists. Suseongmot Lake has plenty of unique and interesting things to see, but is most attractive at night. 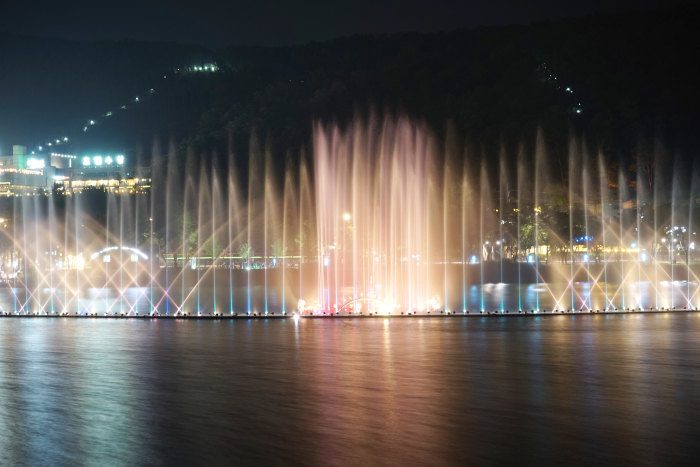 Buskers perform around the lakeshore, and a vibrant fountain show takes place in the middle of lake. The jets of water move quickly to the beat of music, and are lit from below by fantastic colored lasers for a night scene that is unforgettable. Directions (Anjirang Gopchang Town → Suseong Resort, approx. 40 minutes): Walk approx. 305m to Anjirang Negeori 1 Bus Stop → Take Bus No. 564 to Deokhwa Middle School Entrance Bus Stop → Walk approx. 765m to Suseong Resort. ※ No show on Mondays for fountain maintenance and cleaning. Fountain show does not operate November-February.